One on the most emergent on innovation is the Gastronomy, lately it’s not so hard to see how chefs co-work with specialists from other fields (as chemistry, industrial engineering, food industry) and taking advantage of this other field’s achieves for helping with their researches. Today’s culinary schools teach very well how to cook, rarely take care of metaculinary aspects, which are the ones who go far beyond of what is strictly edible. We refuse the idea that chef’s role is limited as a dishes and menus maker, but we consider that they should be able to conceive integral experiences. Gastronomic integral experience means in addition of taking care about dishes and dining halls, to care about the time it is needed between dishes to be properly tasted. 1. One possible line of research in cooking could be one who cares about the gastronomic experience itself, beyond the dish, what we called the metaculinary. 2. Metaculinary involves all the factors which modifies the culinary perception further I’s physical reality. 3. Nowadays schools should give their student the tools which lets them to enrich the gastronomic experience in order to go far beyond the table itself, to go through all the commensal’s senses. 4. 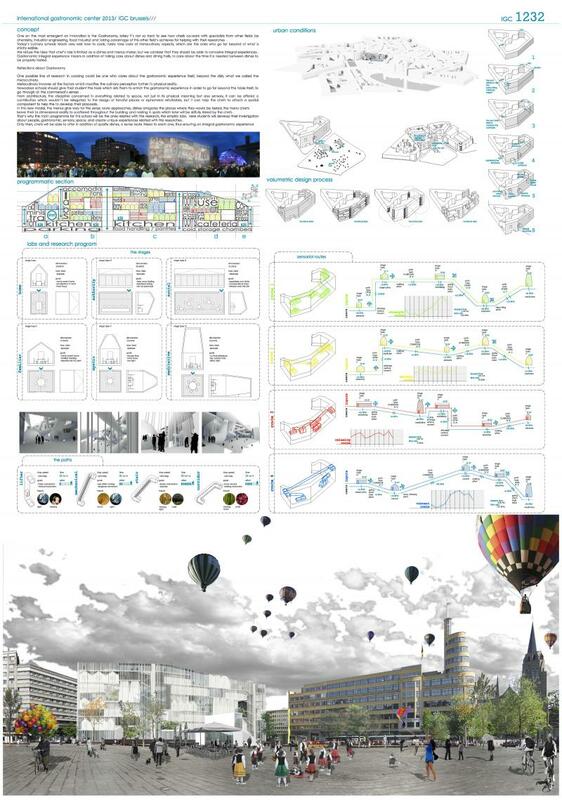 From architecture, the discipline concerned in everything related to space, not just in its physical meaning but also sensory, it can be offered a contribution which wouldn’t be relegated to the design of fanciful places or ephemeral refurbishes, but it can help the chefs to attach a spatial component to help the to develop their proposals. 5. In this new model, the menus give way for the sense route approaches, dishes arrogates the places where they would be tasted, the menu charts leave their bi dimensional reality to scattered throughout the building and nesting in spots which later will be skilfully linked by the chefs. 6. That’s why the main programme for this school will be the ones related with the research, the empiric labs. Here students will develop their investigation about people, gastronomic, sensory, space, and create unique experiences related with this researches. Realmente estamos muy emocionados Marco y yo de haber obtenido una mención especial en este concurso. Nos ha parecido todo un acierto el tema y el jurado. Las diferentes movilidades que planteáis en el interior del proyecto me parecen un acierto. ¡Felicidades por el trabajo!